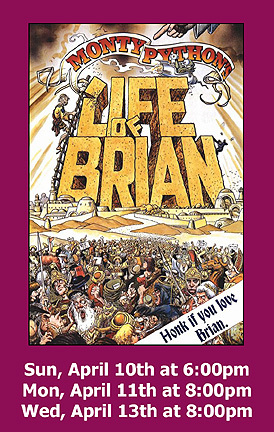 Description: Monty Python fans rejoice: The comedy troup's 1979 satire, MONTY PYTHON'S LIFE OF BRIAN, screens for three days in Seal Beach at the venerable Bay Theatre. Sunday at 6pm, Monday at 8pm, and Wednesday at 8pm; no screening Tuesday. This was the inspiration of such later films as YEAR ONE with Jack Black, but the Python original stands well above.